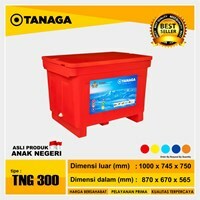 Cooler Box / Cooler Box Tanaga 300 LitreTanaga Coolbox is a product that is used as a place to store food ingredients such as fish, meat, shrimp, vegetables, fruits, cold drinks, frozen food and other food needs. Tanaga Coolbox is very economical, environmentally friendly and durable because it is made from pure seed ingredients without mixed ingredients and is resistant to hot weather so as to maintain the freshness of raw materials from your products. 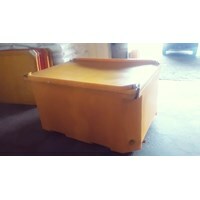 Anda Mencari "Fishery Cooler Box"? 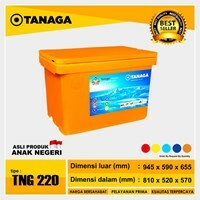 Buat Permintaan Untuk "Fishery Cooler Box"
Cooler Box / Cooler Box Tanaga 220 LitreTanaga Coolbox is a product that is used as a place to store food ingredients such as fish, meat, shrimp, vegetables, fruits, cold drinks, frozen food and other food needs. Tanaga Coolbox is very economical, environmentally friendly and durable because it is made from pure seed ingredients without mixed ingredients and is resistant to hot weather so as to maintain the freshness of raw materials from your products. 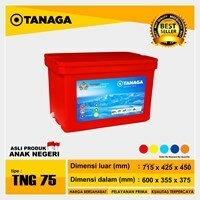 Box Pendingin / Cooler Box Tanaga 75 LiterTanaga Coolbox adalah sebuah produk yang dipergunakan sebagai tempat penyimpanan bahan makanan seperti ikan, daging, udang, sayur – sayuran, buah – buahan, minuman dingin, frozen food serta kebutuhan bahan makanan lainnya. 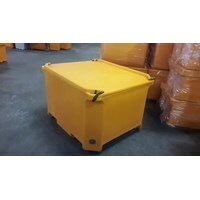 Tanaga Coolbox sangat ekonomis, ramah lingkungan dan tahan lama karena terbuat dari bahan biji plastik murni tanpa bahan campuran serta tahan terhadap terhadap cuaca panas sehingga dapat menjaga kesegaran bahan baku dari produk anda. 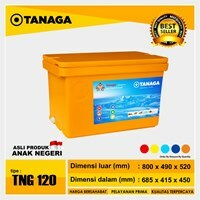 Cooler Box / Cooler Box Tanaga 120 LitreTanaga Coolbox is a product that is used as a place to store food ingredients such as fish, meat, shrimp, vegetables, fruits, cold drinks, frozen food and other food needs. Tanaga Coolbox is very economical, environmentally friendly and durable because it is made from pure seed ingredients without mixed ingredients and is resistant to hot weather so as to maintain the freshness of raw materials from your products. 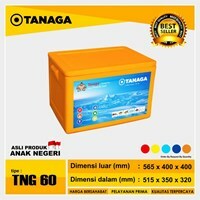 Cooler Box / Cooler Box Tanaga 60 LitreTanaga Coolbox is a product that is used as a place to store food ingredients such as fish, meat, shrimp, vegetables, fruits, cold drinks, frozen food and other food needs. Tanaga Coolbox is very economical, environmentally friendly and durable because it is made from pure seed ingredients without mixed ingredients and is resistant to hot weather so as to maintain the freshness of raw materials from your products. 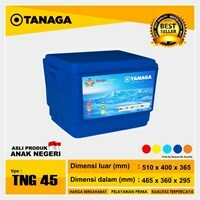 Cooler Box / Cooler Box Tanaga 45 LitreTanaga Coolbox is a product that is used as a place to store food ingredients such as fish, meat, shrimp, vegetables, fruits, cold drinks, frozen food and other food needs. 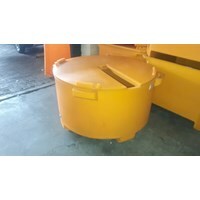 Tanaga Coolbox is very economical, environmentally friendly and durable because it is made from pure seed ingredients without mixed ingredients and is resistant to hot weather so as to maintain the freshness of raw materials from your products. TANAGA Cooler Box is a tool used to store food ingredients such as meat, fish, shrimp, vegetables, fruits, ice cubes, cold drinks and others.